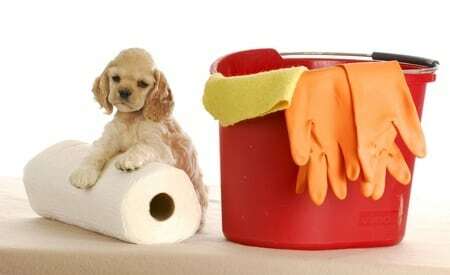 A dog is a man’s best friend, and other pets can be like members of the family, but they’re not the independent creatures who can clean up after themselves, thus it requires us to do the job for them. Cleaning up after pets calls for two strategies, actually three. The first is training them to avoid such messes like house breaking them properly, not allowing them in certain areas and making sure they understand this. Leaping up on the sofa or lounging on the kitchen table are no-nos for most pets although there are ranges of how much comfort a pet is allowed in the house. The more leverage they are allowed, the more cleaning you’ll have to use. The second strategy is to prevent problems. This includes brushing them properly, bathing them properly, and cleaning up before they come into the house. There are all sorts of new gizmos out there that work mostly on keeping paws cleaned. Cats and dogs particularly, will trounce through the most messy environments, dogs in particular. Before they enter the home you can wipe off their paws and inspect them. Some doggie and cat entry doors have rough carpet that can wipe off the mud and dirt to a good degree. Put pet doors in areas that won’t lead directly to the expensive carpeting or kitchen floors. The basement entry is a good one as they’ll have to walk across concrete or inexpensive carpeting first. Finally, is the cleanup. For animals with hair or fur, use brushes on the furniture. Velcro brushes work fine. Vacuum cleaners with extensions should get to the wide areas and hard to reach places. For those messy messes, you’ll need disinfectant cleaners like vinegar and warm water. Other cleaning solutions can be used but you don’t want to poison your pets so check with your local pet store for the safe products to use. Since there are all sorts of pets, we need to look at the variety of species. People will make a pet out of anything, even animals that are dangerous. From big cats to birds, to even reptiles, and aquatic animals. Cleaning up an aquarium for example takes skill as you don’t want to kill the creatures inside. This can range from fish to snails, turtles, small lizards, frogs. There’s a procedure for moving the contents of an aquarium and a good book on the subject is best to serve as procedural reference. You just can’t dump the aquarium contents in a bucket and use a spray cleaner. That might kill the pets. Sometimes good old fashioned vinegar and warm water to clean the enclosure will work. For birds, some people have open perches for the big ones like the colorful tucans and parrots. There are products that people put at the bottom of these to capture the droppings and spilled food. In the old days people used newspapers but there are more efficient and cleaner products available at your pet store, or you can make on your own. Knowing your pet’s habits, timing for messes is also good. You’ll be able to anticipate and prepare. You can’t control everything about an animal but you can minimize the messes with some attention and loving care.